Rock anchors and protection course. Unlock the Freedom to Explore. Are you an experienced gym climber who has began or wants to make the transition outdoors? The natural progression is sport climbing as it requires similar technique and is an affordable first step. The thrill of cragging with friends has you hooked but you are restricted by the boundaries of the bolts. 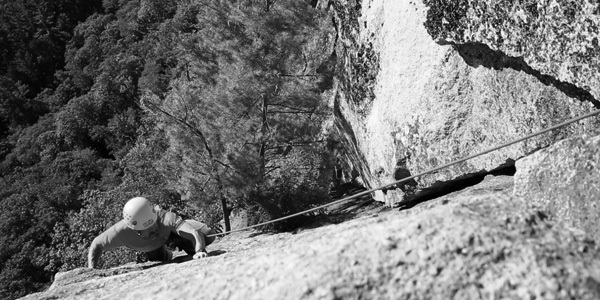 The next transition is a step back in time to traditional [trad] climbing. challenge yourself and open the door to exploration without restrictions by mastering techniques, placing your own protection and building your own anchors. Expand your horizons and explore outdoor climbing with this course! Once you understand the fundamentals of rock protection, put it to use with a day of mock leading. Our goal is to make your mountain adventure as memorable and comfortable as possible. To do this, you must be properly prepared. 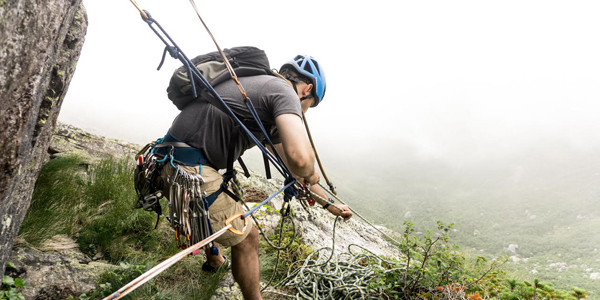 We provide all of the technical gear that you will need for an awesome adventure. However, we ask that you please bring your own clothing - including but not limited to: a base layer for top and bottom, climbing or snow pants, some insulating layers and jackets, socks and warm gloves or mittens. When selecting clothing for your adventure, choose synthetic materials, wool, or fleece as cotton will absorb sweat and freeze - increasing the chances of hypothermia. For your convenience, we have the mandatory gear available for rent! We also have a small selection of clothing available for rent if you are missing anything listed above. Upon completion of registration, you will receive a welcome packet via email with a gear rental form that you will complete and return to reserve the gear you need for you adventure! We will meet at 8AM at our bunkhouse in Bartlett, NH unless otherwise stated. We will take 30 minutes to outfit you with any rental gear you need and head out to the cliffs. What gear is needed for Ice Climbing? The mandatory items include mountaineering boots, crampons, ice tools, harness, helmet, backpack, food, water, and proper clothing. The gear rental package costs $79 and includes crampons, ice tools, harness, gaiters and helmet. Will hiking or winter boots work? Unfortunately no. You will need proper mountaineering boots for ice climbing. Please come dressed in appropriate clothing. Layering is the best practice in the outdoors as it allows you to manage your body temperature. You can check out our “Equipment List” for more info. Be sure to have an extra warm jacket for when you are belaying. Ice climbing can be very safe when conducted properly, especially top-roping. Our guides are trained to mitigate the dangers of falling ice and other inherent hazards. How difficult is it to ice climb? We offer a maximum ratio of 6 clients per guide for top-rope climbing and a maximum of 2 clients per guide for multi-pitch climbs.